The PERLA color palette compliments the self-reported measures of race and ethnicity. Skin color ratings have been used in several surveys about racial discrimination and racial attitudes in the United States (Keith and Herring 1991, Gullickson 2005) but have rarely been used in Latin America. The availability of a variable denoting skin color as observed by the interviewer allows us to reasonably fix actual skin tone rather than rely solely on self-identification of race/ethnicity. For skin color ratings, interviewers rated the facial skin color of each respondent according to colors on a skin color palette, which was not shown to the respondent. 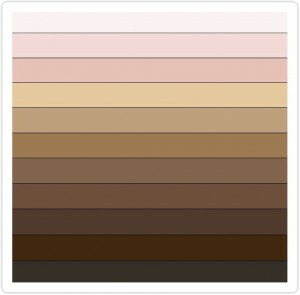 The palette included eleven skin tones, with “1” being the lightest and “11” being the darkest. The colors of the palette came from internet photographs and the palette was extensively pre-tested for ease of use by interviewers and to see if covered the range of colors found in the field. Interviewers were advised that the survey was interested in rating skin color because social science evidence has shown that ordinary people commonly evaluate the skin color of others in everyday interactions and often treat them according to ideas based on color/race. Though such skin color evaluations by interviewers are not perfect by any means, we believe they closely capture actual color among a large number of cases, as in the survey samples we have collected. Read: A Test That Sun Exposure does not affect Latin America’s “Pigmentocracy” as Measured by the PERLA Color Palette.